I’m sneaking this one in here by the skin of my teeth, not to disappoint my loyal Cupcake Friday followers. Once again, I have failed to make cupcakes this week (although I did make my favorite stand-by cookie, stay tuned for that one if I ever get around to writing blog posts again). It’s been a really busy week, folks, and I know we’re headed into the busiest time of the year, and I haven’t even told you about my Thanksgiving recipes yet! I’m so sorry. I’ll try, I promise! For now, here’s your last minute dose of cupcake lust: Chambord Cupcakes from My Baking Addiction. 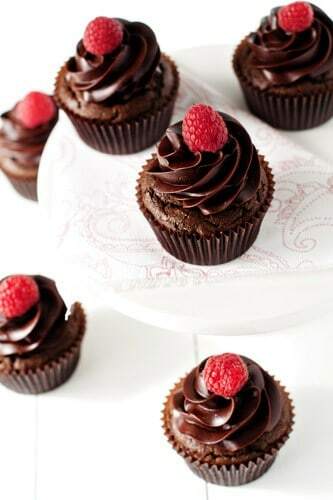 These cupcakes combine two of my favorite things (chocolate and Chambord – which in case you aren’t familiar, includes one of my other favorite things, raspberries) into one of my favoritest things – cupcakes. I have some stories for you about Chambord. Would you like to hear them? I invented my own drink once, many years ago. It’s a very chick drink, but it’s delicious and I highly recommend it. I can’t give you measurements, because when it comes to booze I basically just pour by instinct, but it’s basically this: start with Mike’s Cranberry Hard Lemonade. Pour it into a red wine glass (the enormous kind that can hold an entire 12 oz bottle of Mike’s, preferably), then add a shot or two (or three) of Chambord, and then a splash of Bacardi Razz. If you’re feeling frisky, also add a splash of Absolut Mandarin. For a long time, this drink didn’t have a name. Then a friend advised me that you should always name drinks after your invisible childhood friends. So the original version is the Lisa, and if you add the Absolut Mandarin, it becomes a Crazy Lisa. Try it, and let me know what you think. It could probably benefit from a bit of actual cranberry juice to cut the sweetness. I drank many of these in my early 20s. They were delicious. Shortly after inventing the Lisa, I tried to switch to the cheaper stuff. You know, name brand liquor is expensive, and there are so many knockoffs, surely dropping down just one level wouldn’t be too bad, right? I bought a bottle of Chateau Monet. It was about $10 cheaper, but certainly not bottom of the line. I thought I was safe. Fate advised me otherwise, at least for Chambord. One night, when I was about to mix myself a drink in my dad’s still-under-construction kitchen with poured concrete floors, I picked up that bottle of Chateau Monet. I had carried it half way from the cabinet to the counter (a journey of about 48 inches) when the unthinkable happened – my hand slipped, and the bottle went crashing to the floor. It shattered. Did I mention that the poured concrete floors were also cut into large tiles, a continuous pattern of diamonds across the kitchen and eating nook, towards the laddered hole that should have been stairs? When the Chateau Monet shattered, the thick, dark purple, sticky sweet raspberry liqueur instantly discovered the wonders of that floor. It found pathways through the tiles that I never knew existed. It learned to creep both across the floor and under the plywood temporary cabinets. It crawled, seeped, and poured across the kitchen, filling crevasses with sugar and booze and berry. I cleaned up the glass, wiped the tiles, and toothbrushed out the seams, thanking whatever gods that I had not just shattered a bottle of true Chambord. I never bought the cheap stuff again. One of my daydreams is to make Chambord Ice Cream. I did actually find a recipe, but I haven’t tried it yet. I’m expecting I’ll get around to these cupcakes first, but maybe I’ll make them both together. Chocolate Chambord cupcakes with Chambord Ice Cream. How could you go wrong? Recently (okay, not so recently), I was recruited to make a friend’s birthday cake. I didn’t confess at the time, but this was my first ever layer cake. If I had owned up ahead of time, I’m not sure I would have been trusted with the task, but once I had committed it was too late, and I was forced to learn.